Responding to criticisms over his state's controversial new law that voids cities' anti-discrimination rules protecting members of the LGBT community, North Carolina Gov. Pat McCrory has issued an executive order that "seeks legislation to reinstate the right to sue in state court for discrimination." The law, HB2, spawned a lawsuit by the ACLU and brought cancellations of high-profile events that were planned to take place in North Carolina — everything from a Bruce Springsteen concert to an expansion by PayPal. The governor said he is acting "to protect the privacy and equality of all North Carolinians," by both clarifying the law and adding new protections. "I have come to the conclusion that there is a great deal of misinformation, misinterpretation, confusion, a lot of passion and frankly, selective outrage and hypocrisy, especially against the great state of North Carolina," McCrory said in a video address Tuesday, citing feedback about the bill. The North Carolina chapter of the American Civil Liberties Union is calling McCrory's order "a poor effort to save face," with Acting Executive Director Sarah Preston saying that the governor's actions "fall far short of correcting the damage done" by the bill. She added that legal protections are still lacking and that "transgender people are still explicitly targeted by being forced to use the wrong restroom." After the legislation was passed, Attorney General Roy Cooper refused to defend it from any challenges, saying, "House Bill 2 is unconstitutional. Therefore our office will not represent the defendants in this lawsuit nor future lawsuits." The governor's move comes one day after competing rallies were held over the legislation at the state Capitol, with hundreds of demonstrators voicing their support for McCrory and the law and dozens of counterprotesters calling the law a disgrace, according to member station WUNC. Announcing his signing of Executive Order 93 Tuesday, McCrory said in a videotaped address that his order "maintains common sense gender-specific restroom and locker room facilities in government buildings and schools" while also affirming the private sector's right to establish its own policies. 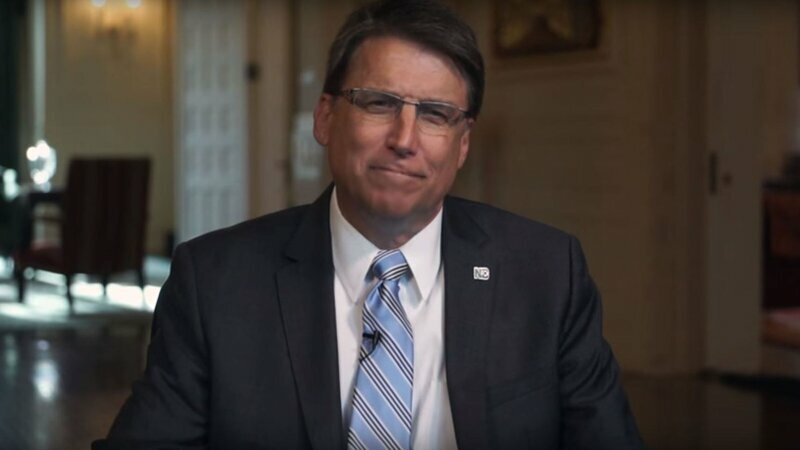 McCrory said that his order expands North Carolina's equal employment opportunity policy to include sexual orientation and gender identity. The governor also called the city of Charlotte's measure that sought to protect gay, lesbian, bisexual and transgender people from discrimination "a solution in search of a problem" and a case of government overreach. The state legislation voiding that measure was adopted in a special session — and signed by McCrory on March 24, a week before Charlotte's law was set to take effect. As Camila wrote for the Two-Way at the time, "The most controversial element of Charlotte's expanded ordinance was the fact that it would allow trans people to use the bathrooms that correspond with their gender identity." News from the North Carolina governor's office that he had signed an executive order that "clarifies existing state law" echoes some of the same language used in a similar case last year, when Indiana Gov. Mike Pence said he supported efforts to "clarify the intent" of a new law allowing businesses to cite religious objections as grounds to refuse to offer services to gay people. Days later, lawmakers in both Indiana and Arkansas (which had a similar law) approved changes to laws that were called "religious freedom" bills by their supporters and deemed discriminatory attacks on rights by their opponents.